Command DOS prompt is perhaps one of the very important tools which can be used to customize almost any feature, permissions, access etc and do many file handing, directory functions. But its black background and white font is unchanged for many years. So if you’re bored with the default colour of the command prompt interface, here is way for you to change the colours and give a new look and feel to your DOS prompt window. cmd in start or Type Win+R, enter cmd and press enter). Right-click on the cmd window’s title bar and click Properties. 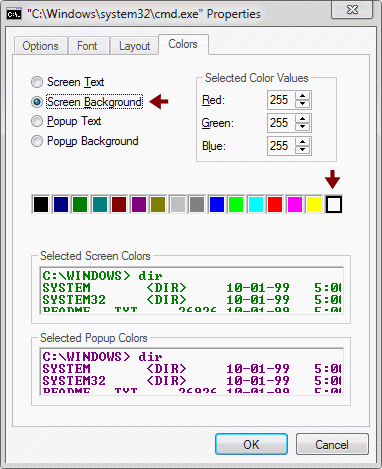 Colors tab, where you can choose colours for "Screen Text" and "Screen Background". Set you desired colours and click OK for the changes to take effect. You can also use the color /? 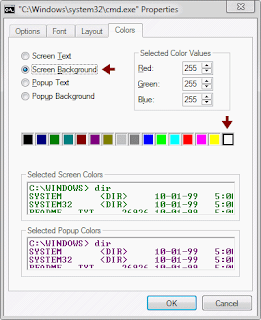 command in DOS to show how you can change the screen text and background colours temporarily for that session directly from cmd itself using color [num][num]. For example color 14 will give you blue background with red text color.